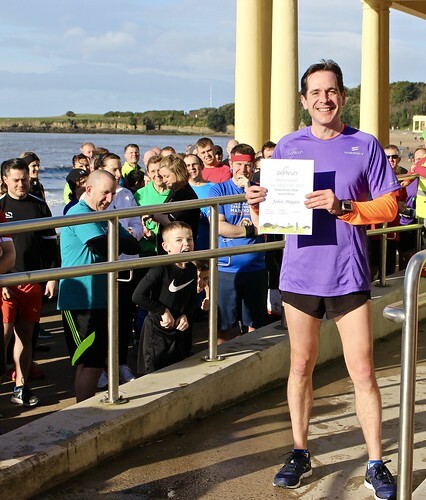 Most weeks, the Barry and District News (http://www.barryanddistrictnews.co.uk/) publishes a Barry Island parkrun run report in its digital and print editions, based on input from that week's Run Director. 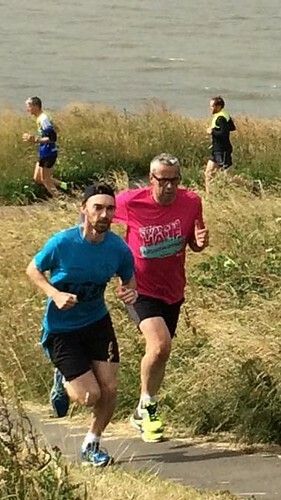 We put up a link to the digital B&D News' report on our event's Facebook page (https://www.facebook.com/barryislandparkrun/) each week. As a result, we no longer write separate run reports for this, our own website. We're grateful to the Barry and District News for their assistance in reporting and helping promote our event. The Barry Island parkrun team. 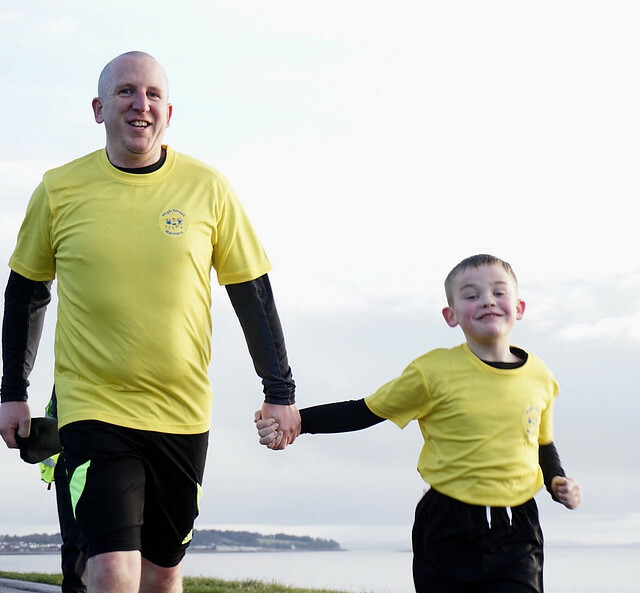 There was certainly a family feel last weekend as Barry Island saw parkrun return to the regular, two lap, course. 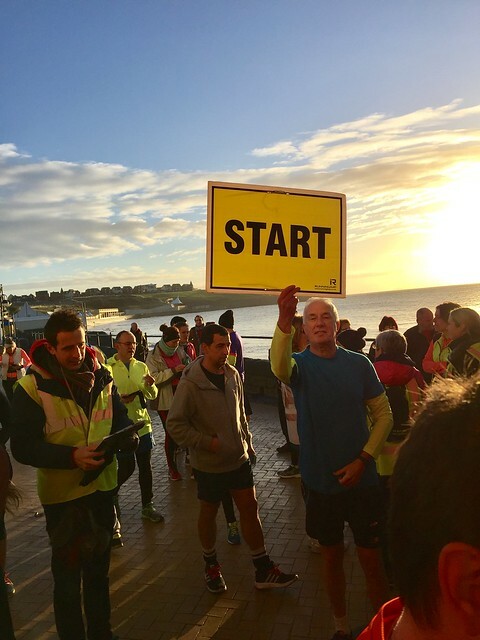 The sun was shining and 132 runners gathered at the Eastern end of the promenade. Volunteer Rachel Gibbs gathered together the newcomers and first time parkrunners and delivered her first new runners briefing. The 14 attentive listeners were soon joining the rest of the field on the start line ready for the off. It was busier than usual with other events taking place around the Island the volunteer team were tight on numbers. A few of the regular runners recognised this and gave up their planned run to assist with ensuring the course remained as safe as possible. Among this weeks first timers were visitors from Swindon, Manchester and Sydney, Australia. Young Darci was visiting the Vale from Down Under to visit her family who are regular visitors to the Island and took the opportunity to run with Oliver, Rhys and James McNabb, whilst Lynette took on barcode scanning duties as one of the volunteer team. Michael Chandler paid his first visit to the Island. Visiting from Swindon Harriers, Michael finished 8th overall in 21:55. Father and son outfit Craig and Andy Gardiner both had good runs with dad Craig finishing in 26:57 whilst Andy, visiting from Cheltenham and County Runners took top spot, crossing the line in 17:54. Thomas Lowrie (JM15-17) was second over the line recording a personal best time of 19:13 having been first to finish once before. Matthew Ryan (VM40-44) was third over the line in 19:52 and has taken top spot on 4 previous occasions. 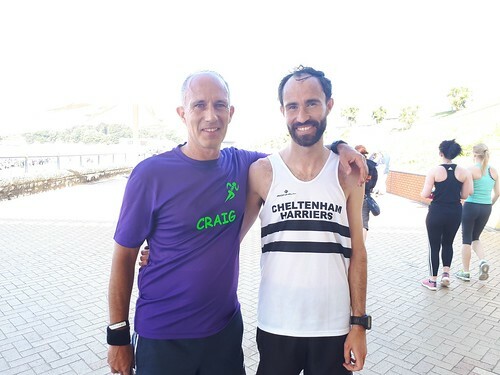 Graham Carrick of Pegasus RC posted a new personal best time of 22:34, finishing in 12th position whilst son in law Rhys Donovan finshed two places further back with 23.17. Splitting the father/son in law duo and also recording a personal best time was Debbie Evans (VW45-49) of Penarth & Dinas Runners. Debbie was first of the ladies to cross the line, finishing 13th overall in 22:46, her first time in 3 appearances. Caitlin Williams (JW11-14) of Seriously Mad Runners (Barry), was second (18th overall) over the line in 24:07 and has been first to finish on 6 previous occasions. Bethan Apglyn (SW25-29) of Penarth & Dinas Runners, was third female finisher and 19th overall, crossing the line in 24:12. 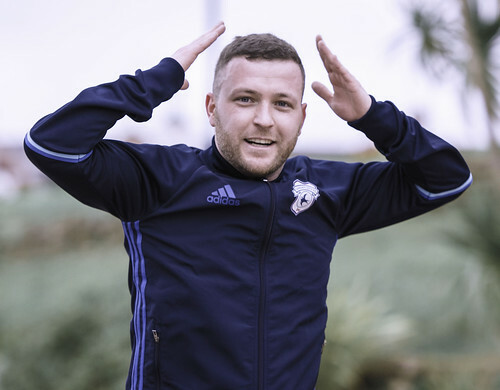 Anyone who runs at Cardiff would have recognised a familiar face at Barry Island this week. With 194 parkruns under his belt, Errol Alexis was paying his fourth visit to the Island run. Errol, who runs in the VM80-84 category crossed the line in 43.19 on his first visit to the course this year. 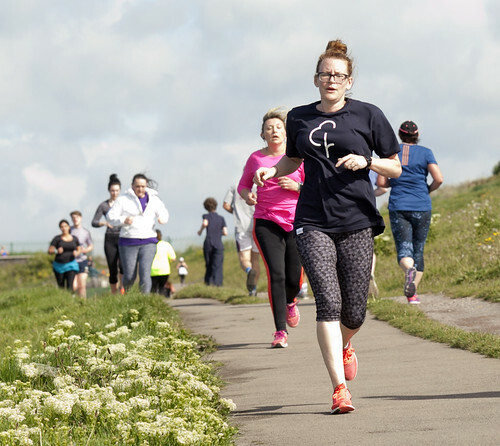 With parkrun becoming more and more popular, newcomers are quickly becoming regulars. Two of Barry Islands new ‘regular’ runners are Amber Pringle and Abbigail Pringle. With 7 and 8 runs respectively both ladies set new personal best times, with Amber posting a time of 26:08 and Abbigail recording a time of 31:43. Once newcomer and now established regular Rebecca Marytsch completed her 38th event in 38:29, with 35 of these taking place at Barry Island. Debbie Evans (VW45-49) – 72.77% for the time 22:46 (13th overall). Thomas Lowrie (JM15-17) – 72.42% for the time 19:13 (second overall). Andy Gardiner (SM30-34) – 72.25% for the time 17:54 (first overall). This week 132 people ran, jogged and walked the course, of whom 14 were first timers and 41 recorded new Personal Bests. Representatives of 13 different clubs took part and the event was made possible by 22 volunteers. 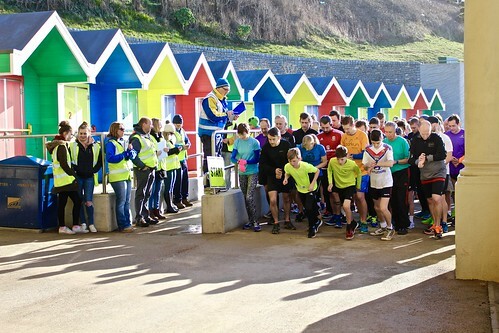 Barry Island parkrun started on 2nd May 2015. Since then 2,648 participants have completed 11,930 parkruns covering a total distance of 59,650 km, including 2,456 new Personal Bests. Saturdays full results and a complete event history can be found on the Barry Island parkrun Results Page. The alternative course greeted this weeks parkrunners for event number 107. The regular course was out of action much to the delight of the 148 runners. The three lap alternative route is a welcome change but only needs to be used when there are events using the promenade and Eastern shelter, these being areas of the regular start and finish. The volunteers and runners congregated at the new meeting point with plenty of new faces paying a visit. parkrun ‘tourism’ is very popular, this is where parkrunners run at a location away from their home parkrun. 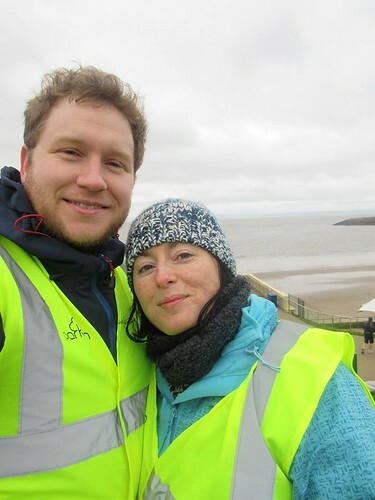 parkrun tourists visit Barry Island weekly and come from far and wide. This week’s run was visited by tourists from Llantwit Major, Port Talbot, Bridgend, Neath, London but most notably by Victoria Tang of Perth Urban Runners and Kayee Tang, both of whom’s home parkrun is Claisebrook Cove parkrun, Perth, Western Australia. Victoria, not surprisingly a first time visitor to Barry Island parkrun crossed the line in 30:37 in her 22nd parkrun, with Kayee, also a first timer to the Island crossing the line in 27:04 in his 202nd parkrun. The event was made possible by 29 volunteers. With some of the regular volunteers unavailable there were a few apprehensive faces as some of the first timers stepped straight into key roles. The newcomers soon realised that all roles are straight forward as all new volunteers are generally paired with an experienced volunteer for their first outing. Andrew Thomas took on a barcode scanning role for his first stint as a volunteer, Frank Atherton issued the finish position tokens and Craig Gardiner took on the funnel manager role. Christian Mears stepped into a timekeeping role for the first time having previously taken on course marshal roles. All carried out their roles superbly thanks to some top coaching from Amber Condy and Mark Bloomfield and under the watchful eye of Run Director Ian Jenkins. No sooner had the field headed off up through the gardens, the front runners were approaching the turnaround point at the end of lap one. There followed a steady flow of runners, this week 148 people ran, jogged and walked the course. 30 were first timers and 10 recorded new personal best times. Representatives of 16 different running clubs took part. The first male finisher and 1st overall was Gareth Poston of Port Talbot Harriers & AC, crossing the line in 18:57, the second time in 13 appearances. Alfie Davies (JM15-17) was second over the line in 19:06 having been first to finish on 3 previous occasions with Christopher Jeynes of Brackla Harriers, third over the line in 19:24. The female placings were taken by Jazmine Briganti of Brackla Harriers, first (12th overall) over the line in 22:36 in her first appearance at the Island and her first ever parkrun. Gwenno GOODE (JW11-14) was second (19th overall) over the line in 23:42 with Louise McKee of Eton Tri, a close third (21st overall) in 23:52 having been first to finish on 5 previous occasions. parkrun is not a race, however this didn’t stop a bit of friendly competition especially from the youngsters. JM10 category runners Oliver McNabb and Deri Hassell, who was taking part in his first ever parkrun, were neck and neck at the final corner, with Oliver taking advantage of the crowd in front of them and just pipping his pal Deri on the line, both finishing in an equal time of 32:57. Among the first time parkrunners was Etta Dobbins of Major Milers Running Club. Etta took on a real challenge for her first parkrun and completed the 5k alternative course in 34:41. Major Milers RC is a new running club aimed at supporting runners of Llantwit Major and the surrounding areas. The club, formed recently by a few Barry Island parkrunners, is open to all of any ability and meet on Tuesdays and Thursdays. Etta was joined by fellow Milers Jo Wain, also taking part in her first parkrun and Martin Hignell who completed parkrun number 20 in 25:55. 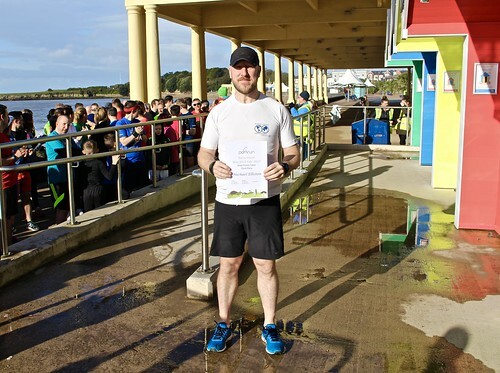 There was a special mention during the pre-run briefing for Stuart Keeping who reached the milestone of taking part in 50 runs, with 45 of these being at Barry Island. Stuart welcomed the round of applause he received from his fellow parkrunners and finished his 50th run in a time of 23:08, 16th position overall. This coming Saturday sees a second consecutive week on the alternative course. 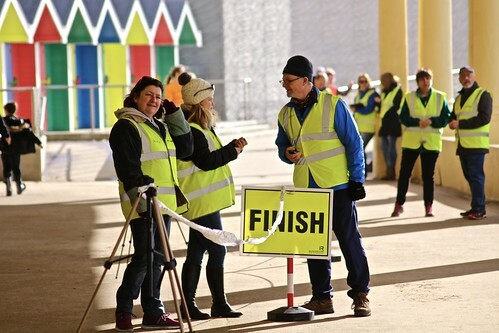 The alternative course requires a few more volunteers than the normal course, so if you would like to help out contact the team via email at barryislandhelpers@parkrun.com or via the Barry Island parkrun Facebook page. The weekends full results and a complete event history can be found on the Barry Island parkrun Results Page. Gareth POSTON (SM30-34) of Port Talbot Harriers & AC, was first over the line in 18:57 - second time in 13 appearances. Alfie DAVIES (JM15-17) (Unattached) was second over the line in 19:06 - has been first to finish on 3 previous occasions. Christopher JEYNES (VM40-44) of Brackla Harriers, was third over the line in 19:24. Jazmine BRIGANTI (SW20-24) of Brackla Harriers, was first (12th overall) over the line in 22:36 - first appearance. Gwenno GOODE (JW11-14) (Unattached) was second (19th overall) over the line in 23:42. Louise MCKEE (VW50-54) of Eton Tri, was third (21st overall) over the line in 23:52 - has been first to finish on 5 previous occasions. Jeffrey COX (VM50-54) – 77.99% for the time 19:32 (5th overall). Ceri TAPPER (VM45-49) – 73.91% for the time 19:29 (4th overall). Louise MCKEE (VW50-54) – 73.88% for the time 23:52 (21st overall). The female record is held by Emma WOOKEY who recorded a time of 00:18:09 on 20th June 2015 (event number 8). The male record is held by Oliver M WILLIAMS who recorded a time of 00:15:58 on 25th March 2017 (event number 100). The Age Grade course record is held by Angharad MAIR who recorded 88.54% (19:55) on 26th September 2015 (event number 21). 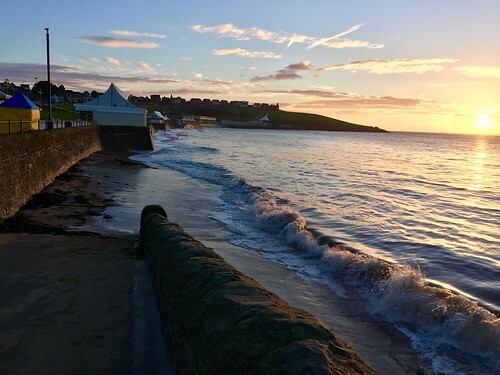 Barry Island parkrun started on 2nd May 2015. Since then 2,528 participants have completed 11,052 parkruns covering a total distance of 55,260 km, including 2,285 new Personal Bests. The Age Grade course record is held by Angharad MAIR who recorded 88.54% (19:55) on 26th September 2015 (event number 21). 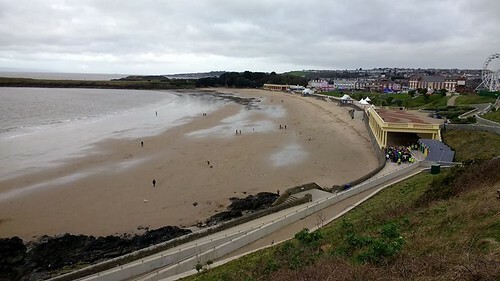 Barry Island parkrun started on 2nd May 2015. Since then 2,528 participants have completed 11,052 parkruns covering a total distance of 55,260 km, including 2,285 new personal bests. 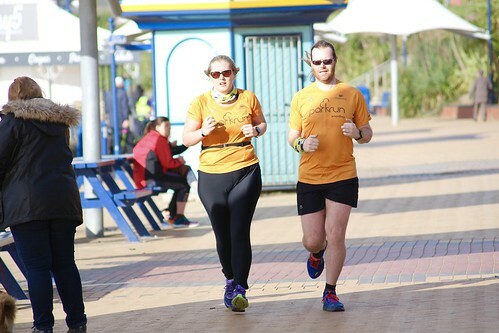 This week’s Barry Island parkrun saw the fifth highest attendance of the 104 previous events with 176 runners taking part, 53 of whom were taking part for the first time and an impressive 34 runners get a new Personal Best time. As well as the regular runners, a group of 27 visitors from Pencoed Panthers made the trip to the seaside for their first attempt at running the two lap, 5km course. With running getting plenty of media coverage in the past 2 weeks, there was also a cheer for the London Marathoners taking part, including Georgina Lloyd from BBC’s Mind Over Marathon program. For the ladies, it was Ruth Owens of Penarth & Dinas Runners in first place and a new Personal Best time of 22:25 followed by Leanne Hockey of White Rock Runners in 23:50 with Kirsty Wilson in third place in a time of 24:05.
parkrun celebrates the achievements of runners by rewarding them at certain Milestones with a commemorative running shirt. This week there were Milestones for Beverly Ooss, Paul Buckle and Harriet Kehl, all running their 50th parkrun. Also, Co-Event Director Lyn Evans was volunteering for the 100th time. This coming Saturday, May 6th sees the 2nd Anniversary of Barry Island parkrun. Organisers are hoping for a bumper turnout to make the event a memorable one. There is also a hint of a couple of celebrity runners paying a visit. As part of the celebrations for the 2nd Anniversary, a short video featuring all the messages that the runners were asked to write at the 100th event. This can be found on Barry Island parkrun’s Facebook Page, or by following this link. As is the custom whenever there’s a celebration involving runners, cake will feature heavily and any cake donations will be gratefully received. 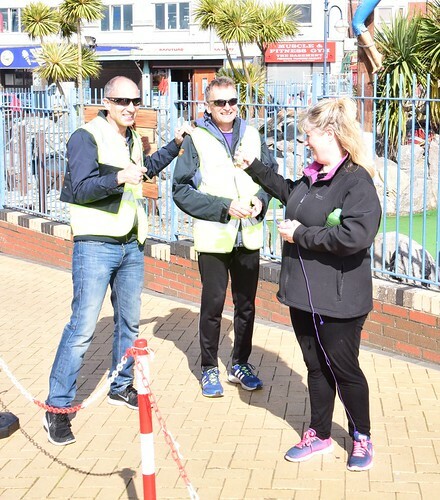 Barry Island parkrun is a totally free timed run and takes place every Saturday at 9am under the Eastern Shelter on the promenade at Barry Island and is only made possible thanks to the volunteers who give up their time each week to ensure the event takes place safely. This week there were 25 volunteers, including one from the visiting Pencoed Pathers. Anyone wishing to take part should first register with parkrun at parkrun.com/register, print the personal barcode and bring it along on a Saturday morning. You don’t have to be a runner to help out and only takes a maximum of 2hrs of your time on a Saturday morning. Barry Island parkrun’s numbers continue to hold up well into 2017, with a 13th successive three-figure field, as 141 runners tackled the 5k course this week. This was the ninety-eighth parkrun and the organisers are hoping for big turn-out to mark their 100th event on March 25th, which could also see the 10,000th finisher over the line and 50,000th kilometre chalked up. There are also unsubstantiated reports of an attempt at the course record being planned. Before setting the runners off, the day’s Run Director, Lyn Evans, presented a certificate to the men’s points league table topper, Robert Newman. Despite being absent for the last few weeks with an injury, Robert had run consistently well since May 2016 to accumulate 3325 points by the end of February. Points Table Topper Robert Newman (right) back in action. Picture by Russell Thorne. Runners ‘In the Zone’ heading through the promenade gardens. Picture by Russell Thorne. Amongst the 141 participants who ran, jogged or walked the course, were 13 first timers and representatives of 14 different clubs. 33 runners set a new course best time, including visitor Geoff Partridge (20:25), Mark Harris (23:04), junior Evan Warburton (25:17), Emma Arscott (26:16), Helen Archer, breaking 30 minutes for the first time with 29:44, Evan Quick (34:50) and clearly enjoying a rare run, Run Director Claire Thorne with 46:32. Run Director Claire Thorne being paced to a PB by husband and Co-Event Director Ian Thorne. Picture by Ian’s brother Russell Thorne - it's a family thing! Helen Archer on her way to her first sub-30 minute time. Picture by Russell Thorne. Junior runners dominated the top placings this week. They took the first 3 overall places and two of the first three female places. Alfie Davies (JM15-17) was first over the line in 19:28, his second time in 5 appearances. Thomas Lowrie (JM15-17) was in second place with a time of 19:45, just ahead of Tom Waters (JM11-14) who clocked his first sub-20 minute time and set a new PB of 19:49. Junior runners setting a fast early pace. Picture by Russell Thorne. Louise Flynn was first female (11th overall) over the line in 21:07 - her 8th time in 10 appearances. Caitlin Williams (JW11-14) of SMR (Barry) was second female finisher in 23:15 and Harriet Kehl (JW11-14) was third over the line in 24:16. First female finisher Louise Flynn. Picture by Russell Thorne. Tom Waters (JM11-14) topped the age grades scores this week with 75.0%. Malcolm Bradley (VM65-69), from Penarth and Dinas Runners, was just behind with 74.4% for his time of 22:46, with Paul Kehl third. Paul’s 74.1% score corresponded to a time 20:13 - a new PB. As the week’s results illustrate with a 50-plus year age gap between the runners with the top two scores, age grading is a good way for runners of different ages to be able compare their times with each other and against benchmarks for their age. 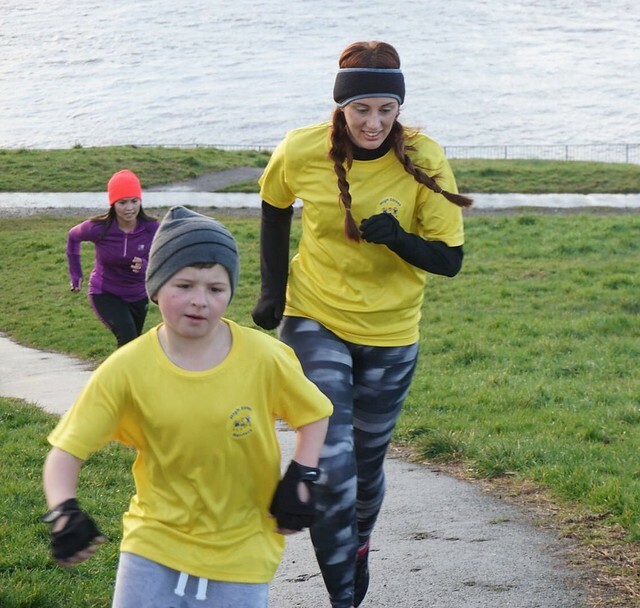 With family groups increasingly running together too, age grades mean that the different generations and genders can compare their times alongside each others’ and set group, as well as individual, improvement targets. Emma, Simon and baby Arscott enjoying a family run together. Picture by Russell Thorne. Martin Monckton being paced to a PB by brother Tim. Picture by Russell Thorne. Smiling tail runner Hilary James. Picture by Russell Thorne. 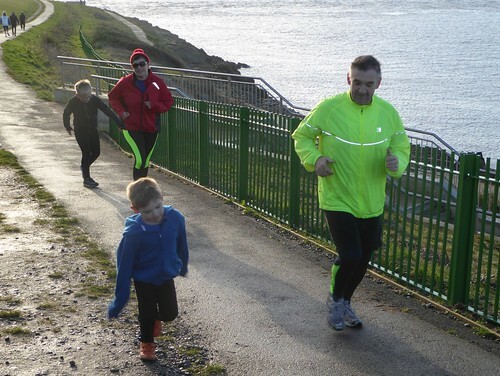 Barry Island parkrun is a free, weekly 5k timed run and is open to anyone of any ability from age 4 upwards - runners, joggers or walkers alike. It starts at 9:00 a.m. every Saturday morning at Barry Island promenade, normally under the Eastern shelter. Find out more on the run website at: www.parkrun.org.uk/barryisland. It’s entirely organised by volunteers. Anyone wishing to help out can get in touch by sending an email to: barryislandhelpers@parkrun.com. 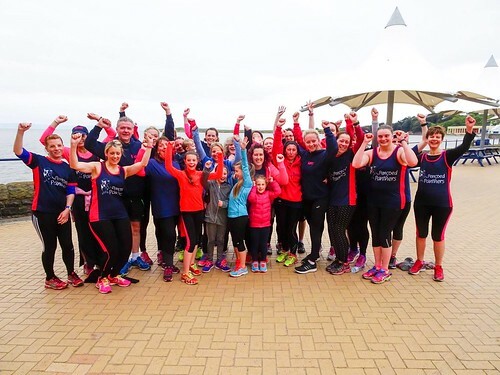 After 98 Barry Island parkruns, 2,303 different runners, including participants from 202 athletics clubs, have completed 9,702 runs covering a total distance of 48,510 km. There have been 2,027 new Personal Bests. They have been supported by 330 different volunteers in 2,146 roles. 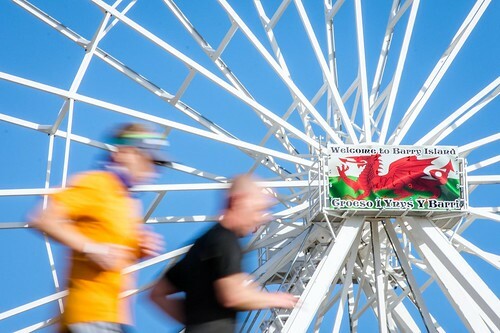 There are 1581 runners who’ve registered Barry Island parkrun as their home parkrun. This week’s full results and a complete event history can be found on the Barry Island parkrun Results Page. More photographs can be found in the Barry Island parkrun Flickr group. Thanks to this week’s photographer Russell Thorne. 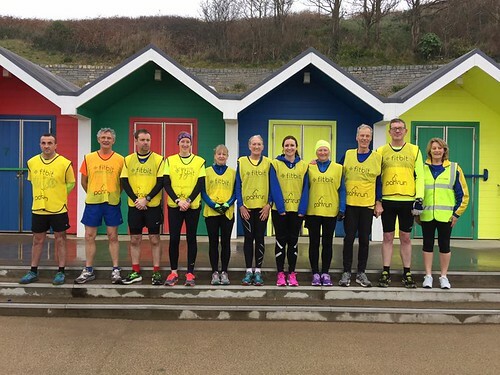 A busy local running weekend made for a full volunteer roster at Saturday’s Barry Island parkrun, as many of the regular parkrunners rested-up ahead of the Cardiff 10k, Newport Half Marathon and a cross-country meet in Swansea. Some of the volunteers took the opportunity to try out new roles. It was still another three-figure field however, as 118 runners took on the 5k course in cold but sunny conditions. This was the 12th successive field of over 100 runners. So far this year, numbers are up by over 70 per cent compared to the start of 2016. Before setting the runners off, the day’s Run Director, Lyn Evans, presented certificates to the points league table toppers. It was a Williams family clean-sweep in the women’s table, with Caitlin in first place on 3476 points, mum Lisa in second on 3240 points and big sister Bethan third on 2980 points. Caitlin (right) and Lisa Williams receive their certificates. Picture by Ian Thorne. Robert Newman topped the men’s table on 3325 points, closely followed by John Magee on 3041 points, with Michael Elliston third on 2839 points. John Magee with his second place certificate. Picture by Ian Thorne. Michael Elliston with his third place certificate. Picture by Ian Thorne. Special certificates were also awarded to the two most prolific volunteers, Dave Shields and Denise Aplin. Both will shortly be taking up Run Director roles at Barry Island parkrun and the new Barry junior parkrun respectively. Denise Aplin and Dave Shields (left) receive their volunteer awards from Run Director Lyn Evans. Picture by Ian Thorne. Runners and volunteers at the ‘gun’. Picture by Ian Thorne. Amongst the 118 runners there 12 were first time Barry Island parkrunners and representatives of 9 different athletics clubs. These included Jenny Mulhearn from Reading Road Runners and Andrew Williams from Park Bryn Bach Running Club. Jenny commented "Thanks for your hard work and that of all of your volunteers. You have a very picturesque run which we really enjoyed this morning." Visitors Jenny Mulhearn and Mike Dimmick from Reading. Picture by Ian Thorne. There was another good crop of Personal Best times this week, with 22 runners setting a new course best time. Junior runners featured prominently on the list, with PB’s for regulars Thomas Lowrie, Tom Waters, Harriet Kehl and Imogen Davies, and for newer but no less enthusiastic runners Evan Gwatkin and Evan Boffy. Some of the senior runners registering a PB included Simon Arscott in fourth place, Brian Thain, Martin Hignell (paced very effectively by Nigel Rees), Jennifer Lewis and Richard Jackson. Speedsters Nigel Rees and Martin Hignell in full flow. Picture courtesy of Jimmy Man. Thomas Lowrie (JM15-17) was first over the line this week with a new PB time of 19:19 - his first top spot in 33 appearances. He was just ahead of Matthew Ryan, who finished second in 19:25. Tom Waters (JM11-14) finished third with a new PB of 20:34. Louise McKee from Eton Tri, was first female (17th overall) over the line in 22:44, her 5th time in 9 appearances. Caitlin Williams (JW11-14) of SMR (Barry), was second (20th overall) over the line in 23:06 and Harriet Kehl (JW11-14) was third over the line with a new PB of 23:52. There were 3 juniors in the top 5 this week, with Ben Ray (JM11-14) from Barry & Vale Harriers picking up 5th spot, and 5 PB times amongst the first 10 places. Some of this week’s junior runners in action on the prom. Picture by Ian Thorne. Phil and Nicola Leach putting in a strong finish. Picture by Ian Thorne. 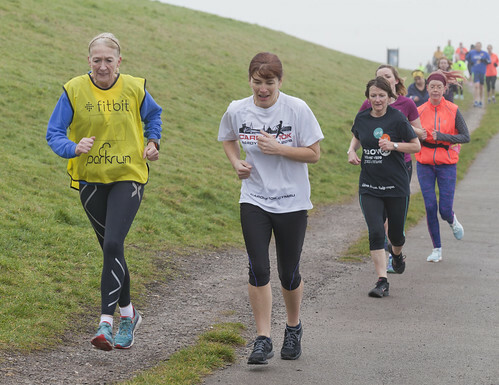 In the UK, more than 2 million people have now registered with parkrun. All that’s needed to enjoy the first full parkrun experience is to sign up, turn up and run (or walk or jog) 5k. Presenting a personal barcode at the finish ensures a time in the week’s results - so don’t forget it. After 97 Barry Island parkruns, 2,290 different runners, including participants from 203 athletics clubs, have completed 9,561 runs covering a total distance of 47,805 km. There have been 1,994 new Personal Bests. They have been supported by 330 different volunteers in over 2,100 roles. This week’s finish line volunteers eagerly awaiting the first runners. Picture by Ian Thorne. More photographs can be found in the Barry Island parkrun Flickr group. A late call for volunteers and a last minute influx made sure that a cancellation was avoided and event #96 could take place as scheduled. With the minimum number reached late on Friday night, some last minute organising and preparation on Saturday morning and 125 runners took their place at the start line ready for the pre-run briefing. To many parkrunners volunteering can seem a bit daunting but this was not the case for first time volunteers Jon Hussey and Hailey Llewellyn-Hussey. After a short briefing on their role from the week’s Run Director and Volunteer Co-ordinator Ian Jenkins, Jon and Hailey, armed with their hi vis vests and two-way radio , set off to their designated marshal position in the car park section of the course. This particularly busy section of the course was well monitored and following the run, Jon and Hailey commented on what they described as ‘a really positive vibe’. Both felt that, as parkrunners themselves, it was an opportunity for them to give something back to the whole parkrun community. 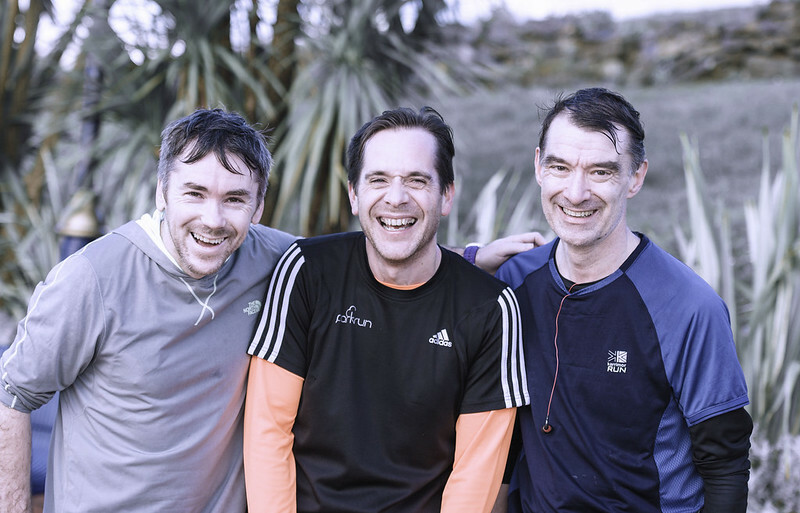 Having now experienced the other side of parkrun and seen what is involved in organising and staging each event, they have both vowed to volunteer again soon. This week saw another 15 first timers to the Barry Island event, with 5 of these joining the parkrun family for the very first time. Among these first timers was Marina Sims of the Sweatshop Running Community, taking a break from her home parkrun of Woodley to notch up parkrun number 50 and earn her 50 club milestone t shirt. On the other end of the spectrum was new Seriously Mad Runners (Barry) member Mike Jenkins. 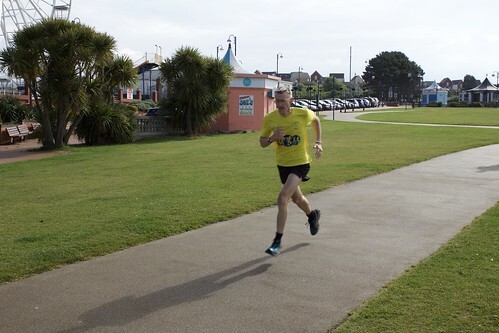 Mike was not only taking part in his first run at the Island but his first ever parkrun, finishing in 25th position overall, a superb run for a first event. Other first time parkrunners were Lynden Mack who put in a fantastic run to finish just inside the top 20, Anna Cox recording a time of 30:31 with youngsters Joshua Brown (JM11:14 category) and Evan Gwatkin (JM10) completing the list with 31:46 and 38:02 respectively. Up at the sharp end it was a close affair for both the top 3 male and top 3 female finishers. Only 33 seconds separated the first three gents and 40 seconds between the first three ladies. Jeffrey Cox of Les Croupiers RC, was first over the line in 20:00, the third time in 30 appearances. Thomas Lowrie (JM15-17) was second over the line in 20:20. and Paul Kehl was third over the line in 20:33. Caitlin Williams (JW11-14) of Seriously Mad Runners (Barry), was first of the ladies over the line in 23:36, the 6th time in 70 appearances. Leanne Hockey of White Rock Runners, was second female over the line in 24:12, having been first to finish on 2 previous occasions. Harriet Kehl (JW11-14) was third female finisher, crossing the line only one second adrift in 24:13 and has been first to finish once before. This week saw 24 runners recording new personal best times. It was a double celebration for SMRs Ally Twigg who started her birthday weekend with a new PB. 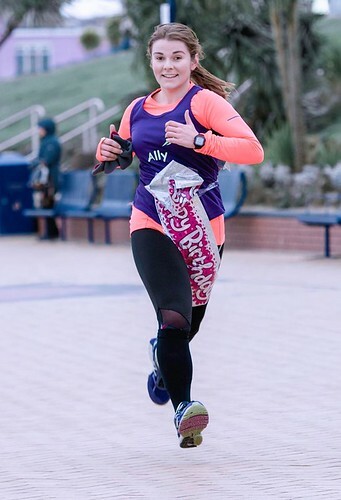 Ally, a regular at Barry Island parkrun and SMR training sessions, also leads some training sessions with the Barry based club. The training is certainly paying off as Ally recorded her first sub 25 minute run, crossing the line in 24:42. 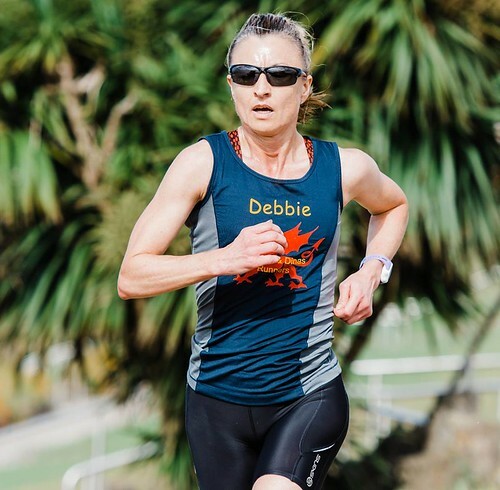 There was another birthday this weekend, this time for Barry Island ‘Original’ Kirstine ‘Heartbreak Hill’ Hughes, with plenty of high fives and birthday wishes from the runners. Kirstine can regularly be seen at the top of the hill (as it is one of her favourite roles) and topped the event and the mornings birthday celebrations with another helping of her ever popular post run cakes, some of which were saved for the results processing team. Kirstine is one of the Barry Island parkrun original core team members and former run director of the event. To date Kirstine has carried out 101 tasks at 68 Barry Island events with a couple more bagged at Newport whilst in training. 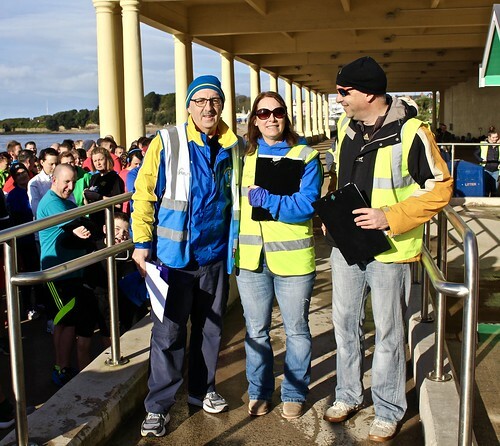 Volunteers are vital to the event so if you are able to help out from time to time or on a more regular basis please contact the team at barryislandhelpers@parkrun.com for further information. 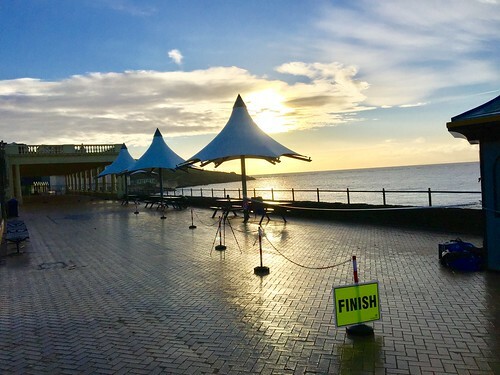 In typical winter style, Saturday saw a cold damp start however this did not stop 170 runners take to Barry Island for the 95th Barry Island parkrun. This was Barry Island’s 4th highest number of runners since the event started in May of 2015. First past the post this week was Gareth Michael Green of San Domenico RC in a time of 17:52, an unknown runner was second while third for the men was John Morris of Taff Running & Orienteering. For the ladies this week, it was a close finish with Junior runner Bethan Hardman of Bridgend AC crossing the line in 23:29 just in front of Gina Hardman also of Bridgend AC who was only a second behind in 23:30. Caitlin Williams of Seriously Mad Runners took the third place spot, in a time of 24:00. This weekend saw the return of the Pacer event, with members from Penarth and Dinas pacing runners at even numbers from 22mins up and including 40 minutes, Sophie Gott who was pacing for 28 minutes also celebrated her 50th parkrun. Pacing weekends are always a big hit with our runners as it gives them the opportunity to chase that PB (Personal Best) which always seems so out of reach. Saturday’s event saw 57 runners managing to push that little bit further and cross the finish line with a new PB. Penarth and Dinas runners were also on hand to answer any questions about their upcoming event, The Porthkerry 5 Multi Terrain race which has proved a very popular run with parkruners. parkrun events are for all abilities whether you are a walker, newcomer to running or a seasoned runner with Olympic quality. 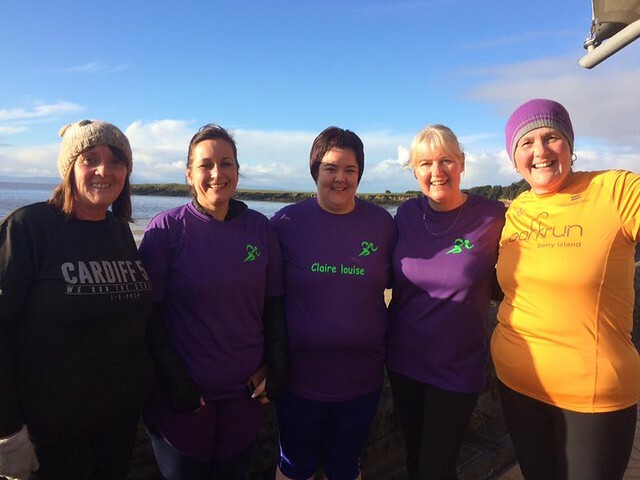 One parkrunner, Helen McCarthy, sent a message to say thank you to Barry Island parkrun and also to local running group Seriously Mad Runners for all the support and encouragement that she has received since joining them. Since 18th June Helen has participated in 33 parkruns at Barry Island and managed to record an amazing 14 Personal Best times. Each week we are luck enough to have our Run Reports published in the Barry & District News. If you are unable to get a print copy of the newspaper, the online version can be found here, you'll find the Run Report in the Sports section. This weeks Stats look like this. Gareth Michael GREEN (VM35-39) of San Domenico RC, was first over the line in 17:52 - second time in 2 appearances. John MORRIS (VM35-39) of Taf Running & Orienteering, was third over the line in 19:14. Robert NEWMAN (Unattached) 3325 pts. John MAGEE (Les Croupiers RC) 2946 pts. Michael ELLISTON (Les Croupiers RC) 2799 pts. Bethan Sian HARDMAN (JW11-14) of Bridgend AC, was first (34th overall) over the line in 23:29 - first time in 10 appearances. Gina HARDMAN (VW45-49) of Bridgend AC, was second (35th overall) over the line in 23:30 - has been first to finish on 3 previous occasions. Caitlin WILLIAMS (JW11-14) of Seriously Mad Runners (Barry), was third (41st overall) over the line in 24:00 - has been first to finish on 5 previous occasions. Caitlin WILLIAMS (Seriously Mad Runners (Barry)) 3376 pts. Lisa WILLIAMS (Seriously Mad Runners (Barry)) 3153 pts. Bethan WILLIAMS (Seriously Mad Runners (Barry)) 2980 pts. Gareth Michael GREEN (VM35-39) was graded 75.84% for the time 17:52 (first overall). Paul KEHL (VM50-54) was graded 73.21% for the time 20:28 (6th overall). Thomas LOWRIE (JM15-17) was graded 71.86% for the time 19:22 (4th overall). This week there were 170 runners, of whom 9 were first timers and 57 recorded new Personal Bests. Representatives of 17 different athletics clubs took part. 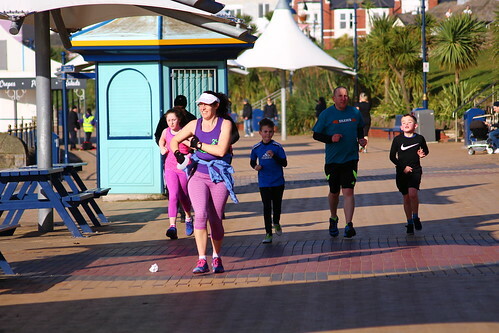 Barry Island parkrun started on 2nd May 2015, and since then 2,263 different runners, including participants from 202 athletics clubs, have completed 9,318 runs covering a total distance of 46,590 km, and there have been 1,948 new Personal Bests. The female record is held by Emma WOOKEY who ran in a time of 00:18:09 on 20th June 2015 (event number 8). The male record is held by Oliver M WILLIAMS who ran in a time of 00:16:14 on 24th September 2016 (event number 73). The Age Grade course record is held by Angharad MAIR who recorded a 88.54% run (19:55) on 26th September 2015 (event number 21). Today's full results and a complete event history can be found on the Barry Island parkrun Results Page. This Saturday saw members from Cardiff based running club, White Rock Runners, takeover the volunteer roster at Barry Island. 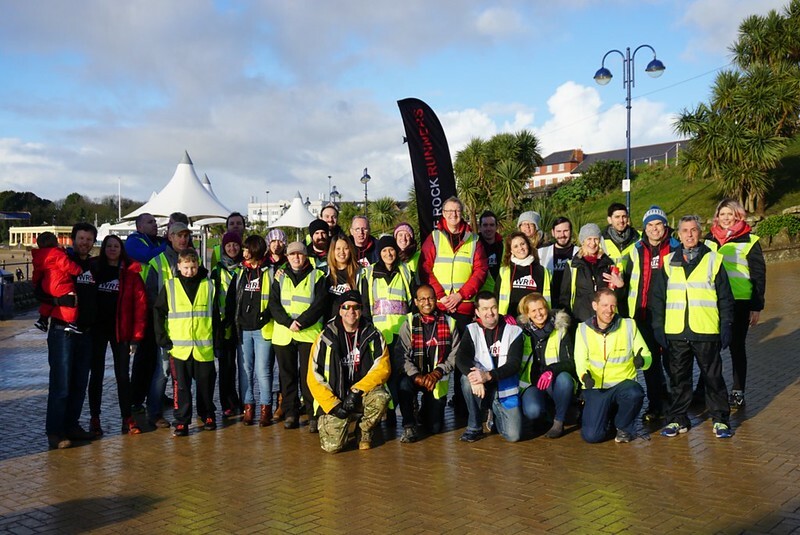 The descent of 28 volunteers from the club enabled most of the regular core team of volunteers the opportunity to run either Barry Island parkrun or visit others across the region. A little about the club; White Rock Runners is a relatively new club to the Welsh running scene. Forming in 2013, upon the disbanding of Virgin Active, White Rock Runners have attracted some 76 members and appear at a number of local events and some further afield (yes, seeing those aircraft land at Cardiff airport got me thinking of milder climes). The take-over was largely co-ordinated by core team member Dave Shields and club chairman Phillip Mears, with club and core team member Ian Jenkins on hand as official Run Director for Saturdays event. Following the event Phillip said “Every Saturday around 25% of White Rock Runners (WRR) partake in a pakrun somewhere across South Wales and are appreciative of the volunteers who make these events happen”. “Without the core teams at each event many parkruns would struggle to go ahead. 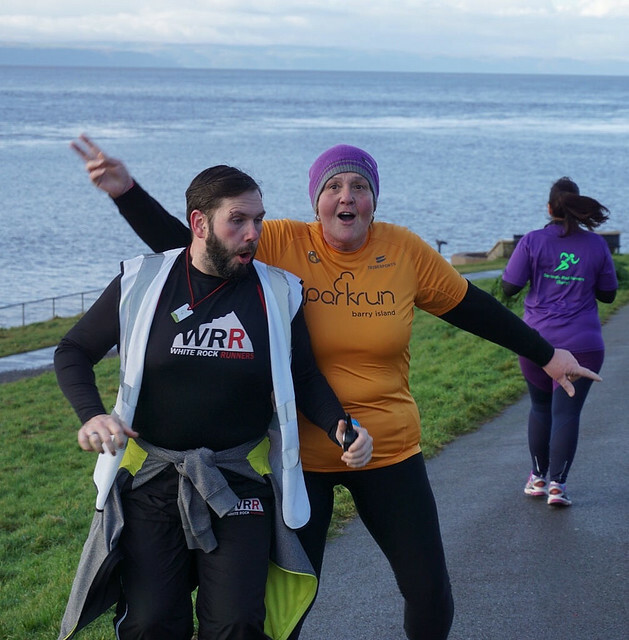 WRR members often volunteer at parkrun and other running events and therefore putting something back into the running community from which we get so much”. “Volunteering is the lifeblood of parkrun and if you've not tired it then why not give it a go - its very rewarding”. The wet stuff that parkrun regulars have come to associate with parkrun was upon everyone but it didn’t really last (thankfully) nor did it dampen the spirits of the 31 strong volunteer team and 116 runners. Arriving at Barry Island, the skies had cleared and all present were left with a beautiful sunrise reflecting on the calm, outward bound tide; maybe this was an omen into how today was going to pan out for the WRRs. All volunteers set up, briefed with their role, and those with marshal points at the farthest end of the course en route to their cheer points – some took this cheering a little bit seriously with some dance moves being busted at the crossover. All were afforded some light rain, as predicted the night before, at the start of the run when the runners set off over the 5km alternative, alternative course. From my vantage point, I could see the runners snaking around the route up to me – fantastic efforts by all runners, whilst a pretty course, it sure is challenging. The rains left us just as quick as they came, making way for some winter sunshine to bring the runners home. First to cross the line for the 4th time in 37 appearances was Matthew Ryan, stopping the watch in 19:34. Paul Kehl was second over the line in 20:37 with John Magee of Les Croupiers RC, third in 20:52. Harriet Kehl, finishing in 24:28, the first time in 22 appearances. Georgina Lloyd was second (23rd overall) over the line in 25:07 with Sophie Gott, third female finisher and 28th overall, crossing the line in 25:30. Heartbreak Hill had its own photographer this week. The photos can be viewed via the link on the official Barry Island parkrun page with some to be found via Facebook and Twitter pages. Thanks go to David Sinclair who carried out a dual role of photographer and course marshal. 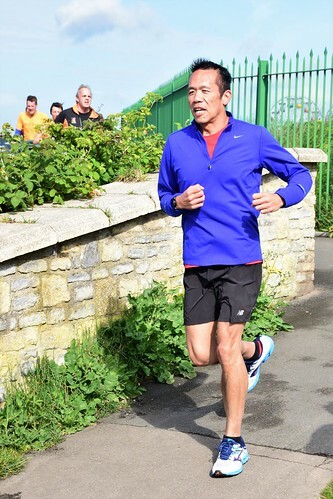 Regular volunteer photographer Kevin Moore, was placed on the promenade and his photos can also be viewed via the link on the official Barry Island parkrun page and the Facebook and Twitter pages. Runners aged +4 are able to participate at parkrun and this week saw the High Street Harriers proudly donning their new kit. High Street Harriers are an after school running group for 9 to 11 year olds. parkrun requires that runners under 11 years of age to be accompanied at all times by a designated adult and must stay within arm’s reach during the running. This rule was followed to the letter, however some of the grown-ups were found wanting and struggling to keep up. Down at the finish funnel, of the 116 finishers, 25 achieved personal best times – well done all. All tokens and barcodes scanned and returned too – thanks to everyone for not taking these home. 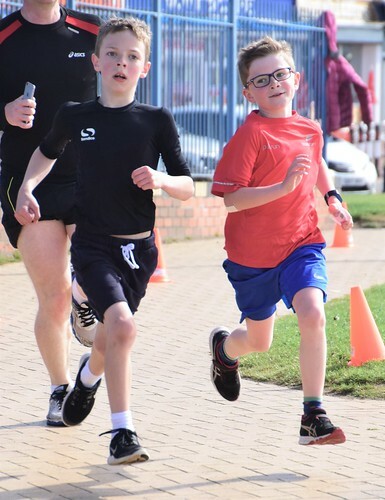 Runners come from far and wide to take part in Barry Island parkrun and Saturday was no exception with visitors from Aberdare Valley AAC, Cwm Ogwr RC, Pencoed Tri and Stoke Striders Recreational Running Group. A very special mention to one core volunteer member, Claire-Louise Thorne. 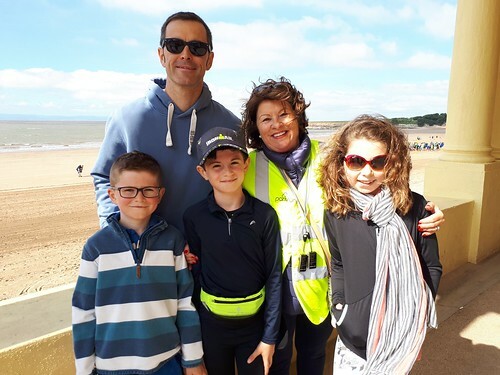 Claire is one of the 4 Run Directors at Barry Island parkrun and has volunteered on 66 occasions, carrying out 109 tasks but has only run it once …. at event 92! Claire can be regularly seen pacing up and down the finish funnel or out on the course when not on RD duty but on this occasion, inspired by the spirit of parkrun, was one of the events 10 first timers. 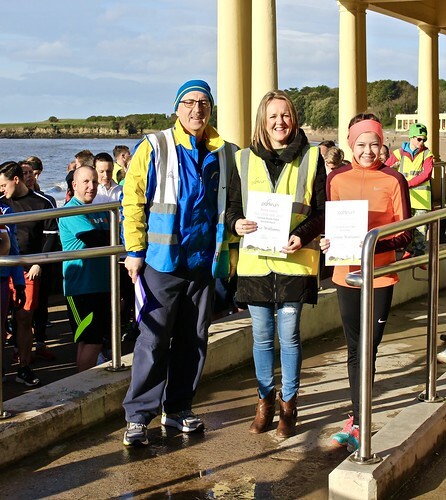 Congratulations Claire-Louise on your Barry Island parkrun inaugural run. I hope you enjoyed running it as much as the volunteers enjoyed cheering you on, and as much as you enjoy volunteering week in week out. During these events, the volunteer team are always on hand to assist any runner or fellow volunteer and will happily answer any questions. Luckily for us we have Mithu ‘barcode scanning but let me grab my coffee’ Rahman. A big thank you to you for your assistance. Before I move on to some achievements and stats, I’d like to take this opportunity, on behalf of White Rock Runners, for letting us takeover your parkrun. We all had a ball and look forward to coming back soon. 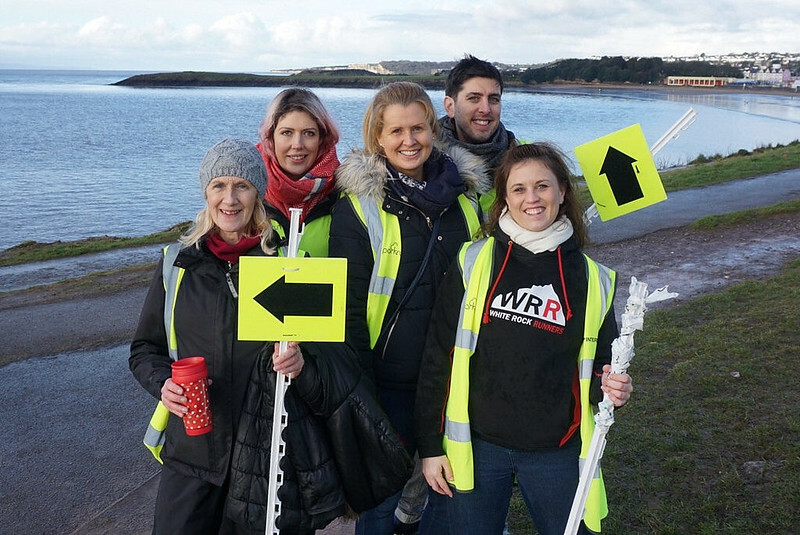 The team at Barry Island parkrun would like to extend their thanks to all at White Rock Runners for their assistance in staging the event and look forward to welcoming them back soon. Matthew RYAN (VM40-44) (Unattached) was first over the line in 19:34 - 4th time in 37 appearances. Paul KEHL (VM50-54) (Unattached) was second over the line in 20:37. John MAGEE (VM40-44) of Les Croupiers RC, was third over the line in 20:52. John MAGEE (Les Croupiers RC) 2759 pts. Michael ELLISTON (Les Croupiers RC) 2532 pts. Harriet KEHL (JW11-14) (Unattached) was first (17th overall) over the line in 24:28 - first time in 22 appearances. Georgina LLOYD (VW40-44) (Unattached) was second (23rd overall) over the line in 25:07. Sophie GOTT (VW40-44) (Unattached) was third (28th overall) over the line in 25:30. Caitlin WILLIAMS (Seriously Mad Runners (Barry)) 3083 pts. Lisa WILLIAMS (Seriously Mad Runners (Barry)) 2881 pts. Bethan WILLIAMS (Seriously Mad Runners (Barry)) 2694 pts. Paul KEHL (VM50-54) was graded 72.68% for the time 20:37 (second overall). Matthew RYAN (VM40-44) was graded 70.27% for the time 19:34 (first overall). Terry CUMMINGS (VM65-69) was graded 68.59% for the time 25:25 (27th overall). This week there were 116 runners, of whom 10 were first timers and 25 recorded new Personal Bests. Representatives of 10 different athletics clubs took part. 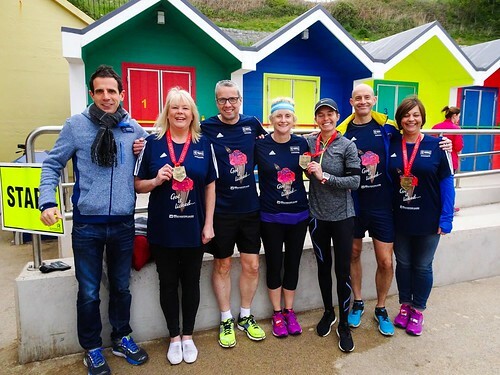 Barry Island parkrun started on 2nd May 2015, and since then 2,216 different runners, including participants from 201 athletics clubs, have completed 8,883 runs covering a total distance of 44,415 km, and there have been 1,828 new Personal Bests. This weeks full results and a complete event history can be found on the Barry Island parkrun Results Page. 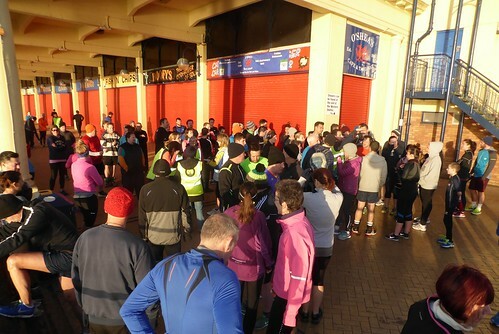 The cold weather and a course change couldn’t deter 116 hardy Barry Island parkrunners on Saturday morning as they made it the fifth successive week with a field of over 100 runners. Pick of thi week's 17 strong volunteer team was Phill Watts, who became the latest member of the milestone club, as he racked up his 25th volunteer contribution. 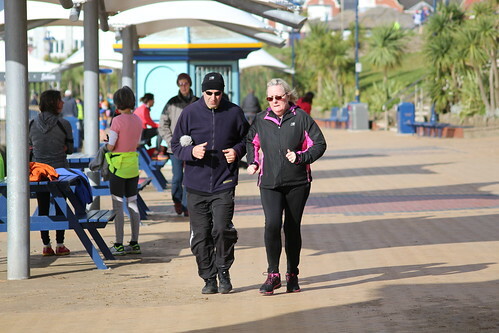 The temporary closure of the Eastern shelter of the promenade, which normally houses the run’s start and finish, meant that co-Event Directors Ian Thorne and Lyn Evans were out on the prom with their calculators and surveyor’s wheel on Friday afternoon. They assessed and measured a temporary 5k course starting, instead, under the Western shelter at the opposite end of the prom. The new course seemed to suit the runners, as they clocked up 19 new Personal Best times, including all top 3 finishers. Regular runners were relieved that the new 2.3 lap course meant only two climbs up Heartbreak Hill on Nells Point, rather than the three they enjoy so much on the usual 3-lap alternative course. The start, finish and turn-around of the temporary course. Picture by Lyn Evans. This was the sight that greeted the early volunteer set-up team on Saturday at the Western end of the prom. Picture by Ian Thorne on Lyn Evans's phone! To ensure a smooth start from its new location, Rich Treadgold guided runners to the shelter in the bright sunshine and Ben Butler-Madden provided the new runners’ briefing. The day’s Run Director, Lyn Evans, then set the runners off heading Eastwards down the prom, before they turned round to pick up the regular course route for most of the remainder of the run. Ben (left) and Richard (right) briefing and guiding the runners at the new start. Picture by Lyn Evans. Runners gather at the new start under the Western shelter. Picture by Malcolm Bradley. The new finish was situated on the approach to the Eastern shelter. Runners and organisers were equally pleased with the new lay-out and so it will continue to be used until the repairs to the Eastern shelter are finished. The new finish location. Picture by Lyn Evans. Helen Archer clearly enjoying the new course in her 22nd parkrun. Picture by Kevin More photography. A smiling family of 4 first timers on Nells point. Picture by Malcolm Bradley. Junior runners featured at the top of the field this week. Joe Hewitt (JM15-17) of Barry & Vale Harriers, was first over the line with a new PB of 18:47, followed in third place by Ben Macey (JM11-14) of Cardiff AAC, in a PB time of 19:22. Visitor Chris Taylor split the juniors, coming home in second spot in a course PB time of 18:49. A focussed lead group early in the run. Picture by Kevin Moore photography. Two first time visitors led home the women runners, as Antoinette Nurse was first female (10th overall) over the line in 21:26, followed in second by Helen Griffiths of Penarth and Dinas Runners, in 24:39. 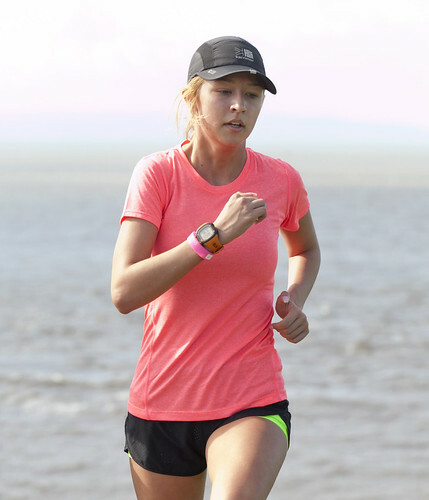 Iona Graham was third female finisher in 26:32 in just her third Barry Island parkrun. A determined group rounding the S-Bend. Picture by Malcolm Bradley. 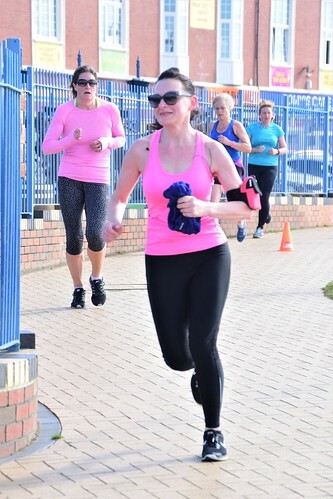 As the number of parkrunners continues to grow every month, it was noticeable that 20 people were first time runners at Barry Island and that 38 runners had so far taken part in 5 parkruns or less. Around the UK on January 7th, well over 110,000 people took part in a 5k parkrun event, easily setting a new participation record. This was not a surprise, as the previous day, more than 12,000 people signed-up to become a parkrunner. This was also a new record. Around the world, more than 3 million people have now registered with parkrun. All that’s needed to enjoy the first full parkrun experience is to sign up, turn up and run (or walk or jog) 5k. Presenting a personal barcode at the finish ensures a time in the week’s results - so don’t forget it. 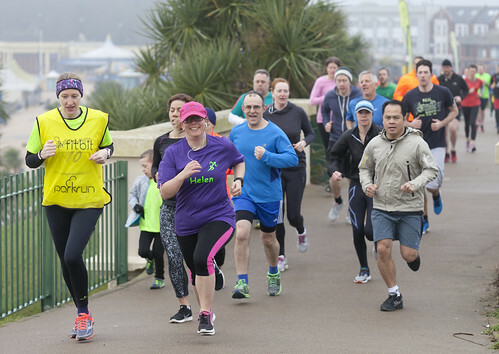 Barry Island parkrun is a free, weekly 5k timed run and is open to anyone of any ability from age 4 upwards - runners, joggers or walkers alike. It starts at 9:00 a.m. every Saturday morning at Barry Island promenade. The start location can vary, depending on what’s happening on the prom. Find out more on the run website at: www.parkrun.org.uk/barryisland. It’s entirely organised by volunteers. Anyone wishing to help out can get in touch by sending an email to: barryislandhelpers@parkrun.com. 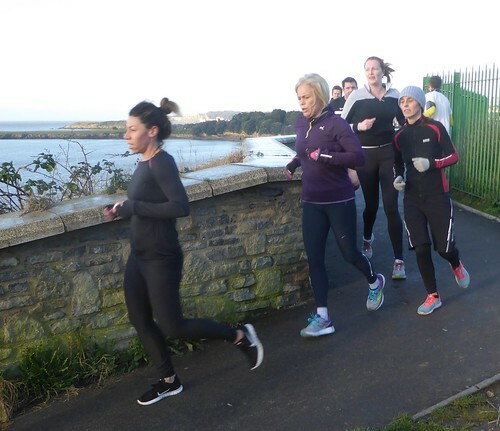 After 90 Barry Island parkruns, 2,184 different runners, including participants from 200 athletics clubs, have completed 8,639 runs covering a total distance of 43,195 km. There have been 1,772 new Personal Best times set. They have been supported by 296 volunteers. 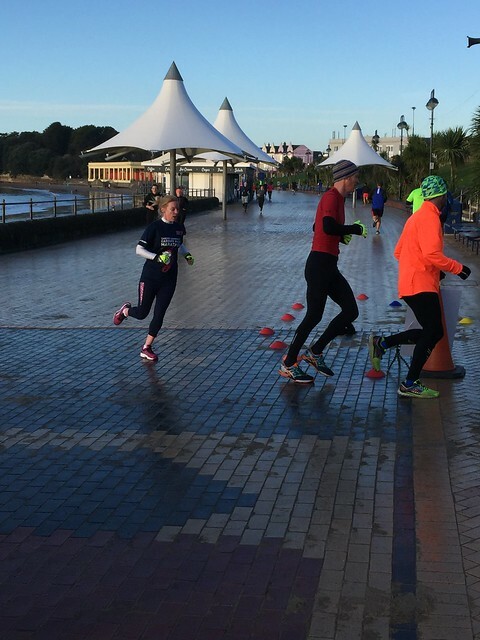 This week's full results and a complete event history can be found on the Barry Island parkrun Results Page. Photos can be found in the Barry Island parkrun Flickr Group.